Become a Friend of Business Digest—it’s free! As a visitor, your access to news and the blog is limited. Privileged Subscribers have access to the news and the complete online archives of Business Digest. You will receive our monthly newsletter that advise you about our newest publications, including syntheses of authoritative books on business management and leadership. 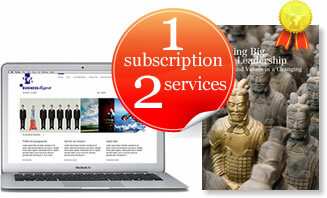 Subscribe to Business Digest and enjoy your Privileges! You will receive our monthly newsletter that advise you about our newest publications, including syntheses of authoritative books on management and leadership and interviews with managers and executives from around the world. You can download our latest publications. You have access to our entire online archive: more than 1,500 dossiers, interviews, and articles on our subscribers-only corner.